Palmia Observatory: First light from new lens and Astronomer finally captures image of Uranus; Physics Colloquia and Astrophysics SIG talk about effects of curved space time; Check out Roger Penrose lectures and get your free ticket; Astrometric analysis confirms it really is Uranus; Waiter, there is a sextant in my martini glass! First light from new lens and Astronomer finally captures image of Uranus; Physics Colloquia and Astrophysics SIG talk about effects of curved space time; Check out Roger Penrose lectures and get your free ticket; Astrometric analysis confirms it really is Uranus; Waiter, there is a sextant in my martini glass! 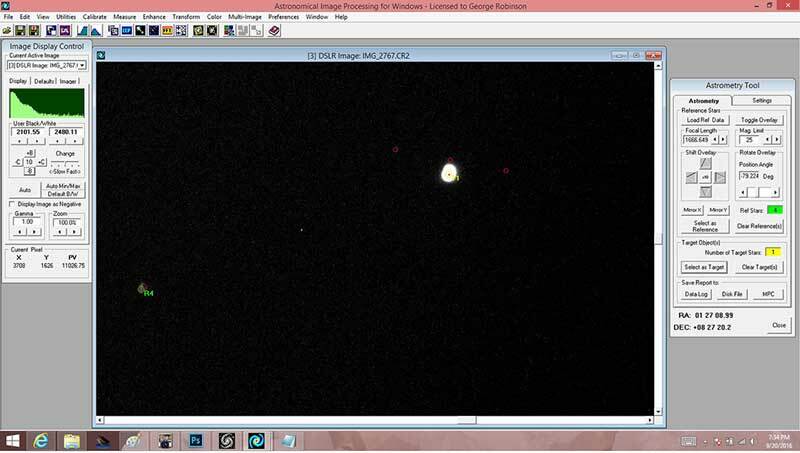 blobs in the image near Pluto's location in the sky? Well, Retired government agent and part time gambler and wine maker, Ilene, responded by saying that she thought the blobs were just UFOs that were following me. Oh ok, I see. Thanks Ilene. Then Author and Bookstore Proprietor, Heidi Francine, said that the blobs were spirits, ghosts or goblins. Ok, I see, thank you Heidi. I guess it just might be possible that my telescope lens could detect UFOs or spirits, but I'm not holding my breath. Before going over the astrophotos and analysis, we should briefly say a couple of things about the Astrophysics SIG and the physics colloquia. The SIG video presentations talked about the recognition that Mercury's orbit did not close on itself, as any perfect Keplerian orbit should, but instead precessed, which means that the point at which Mercury is closest to the sun continues to rotate, with respect to the stars. Now this initial measurement of about 4200 arc seconds per century was mostly explained by including the effects of all the other known planets in the solar system. Once these were taken into account, the remaining 42 arc seconds per century was left as unexplained and even though the discrepancy was very small, it was measurable and troubling because it meant that something about the orbit was not explained by current Newtonian calculus. What was going on? Well, as you all probably know, the answer was eventually discovered by Einstein, which is that large gravitational objects like the sun distort space time to such an extent to cause the measureable precession. The effect is true for other planets also, but it is so small as to be undetectable. Now, I looked back through some of my general relativity textbooks to see just how it is that Einstein general relativity theory modifies Newtonian gravity theory so that the precession is accounted for. The figure below, which shows the differences calculated by the two theories, comes from "A General Relativity Workbook", by Thomas Moore. Since the total orbital energy, the sum of potential and kinetic energy, is constant, the planet orbits between the two radii from the sun, shown as points rc and rf, in the figure. Point rc is at the closest approach to the sun and note how the two curves differ very slightly there and as a result Mercury moves just a tiny bit faster than predicted by Newton and thereby it moves further along and the planet's orbit precesses. Pretty neat. 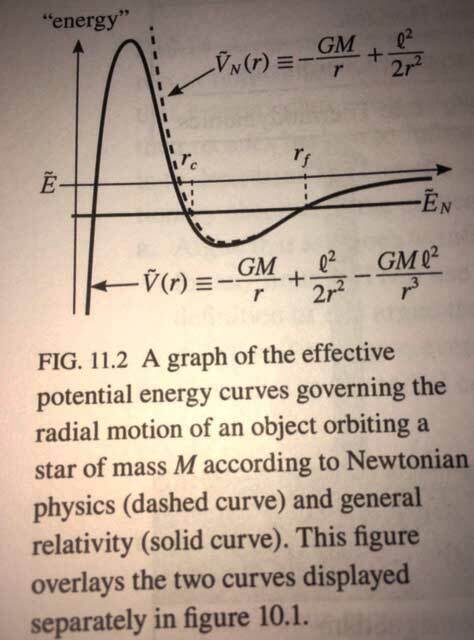 Now you know and can see the extra term in the potential energy equation that general relativity says is necessary. That term is not present in the Newtonian formulation and its effects is quite small as can be seen by the fact that the correction goes up as the inverse cube of the distance. Continuing now with the physics colloquia presentation by a CSUF professor, was of special interest to me in that it is a combination of quantum field theory (QFT) and curve spacetime, as especially around a black hole, is needed to explain Hawking radiation. Now, I had just barely managed to understand about the first third of a QFT seminar conducted by Math Whiz, Dave, which only covered QFT in flat spacetime, so going to curve spacetime was going to be more difficult. Regardless going to curved spacetime was going to be necessary. Recall that Hawking had predicted that black holes have a temperature, very, very slightly above absolute zero, and therefore would evaporate and emit particles and would eventually disappear. The colloquia discussion did not have enough time to get up to Hawking radiation, but it certainly reminded me that my physicist wannabe path will need to be extended to include the effects of curved spacetime. While we are one this path on the need for evidence for scientific theories, and before we get to the actual astrophotos, let's consider the story about the search for evidence for super symmetry (SUSY)at the Large Hadron Collider (LHC). Just recently, this year, the LCH reported an excess of energy, a little blip on the data curve, at about 750 GeV and the physics community went wild with speculation that finally the evidence for SUSY or other new physics was shortly coming. Now the story gets interesting, because over 500 papers were written trying to explain what the 750 GeV bump was caused by and what kind of new physics was being discovered. Now, I only read a couple of these papers, all of which I assume were logical and consistent and did not violate any know physica principles, but nevertheless had no evidence to support their conclusions, except the 750 GeV bump. Well, as the LHC collected more data, the bump completely disappeared and its initial appearance was just a statistical fluke that went away once more data was collected. So, there was no new physics associated with the 750 GeV bump. Now, what are we to make of the 500+ papers released showing how the bump could be explained? To me, it just shows how creative and innovate the real physics community can be. They all had great ideas and they wanted to be first to announce these great ideas. After all, the first disclosure of a great new idea gets you a great place in line for the Nobel prize. But the evidence was not there to support these grand ideas. So, back to the drawing board and wait for more valid evidence. This rule of thumb regarding waiting for and the need for evidence to support one's theories is a key part of the scientific method and helps separate just plain innovative thinking from innovative thinking that is actually supported by evidence. We always need the evidence, otherwise its is just a story that we tell each other at the bar or elsewhere. Finally, on to the astrophotos taken with the new spotter scope. Before using the spotter scope, I had to attach the red dot star finder to the scope. Resident Astronomer Peggy noticed me struggling with this and casually asked if I had read the instruction manual that came with the red dot finder? Well, no, I said, I had not read the manual. She said, "Good, because that way the final story becomes much more interesting!" Hey, wait a minute, what did she mean by that. Well, it turns out, I probably should have read the manual, but at least it worked in the end and not much of a funny story came out of it (This time that is). But the funny stories will continue later because of my initial not reading of the instruction manuals. 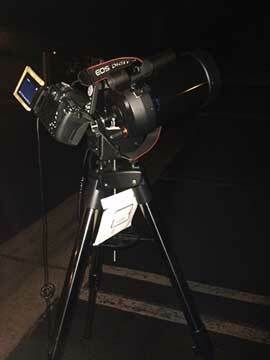 So, with the new lens set up on the light weight alt/Az mount, we were ready to look at the night sky. See the setup below. 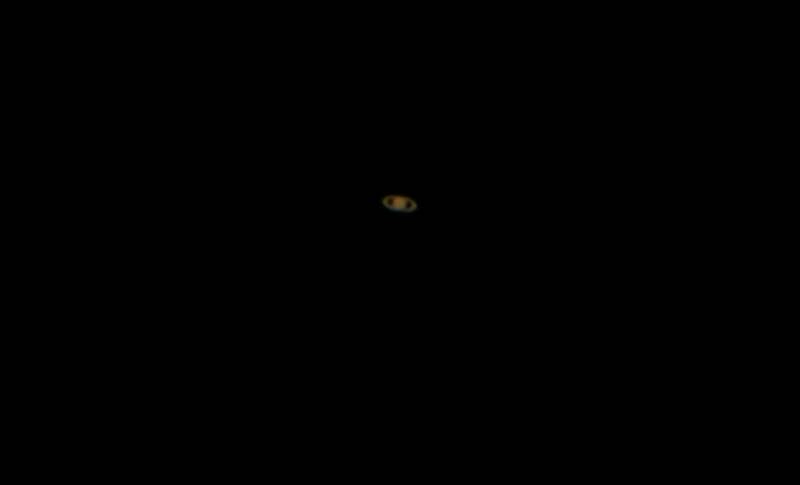 I did a quick solar system alignment, just using Mars, and then slewed the scope to Saturn for a quick test of the alignment and goto capability and took this first image of Saturn. Ok, its still a bit fuzzy, but the image is larger than possible with either my 600mm telephoto lens or big scope with 950mm focal length. 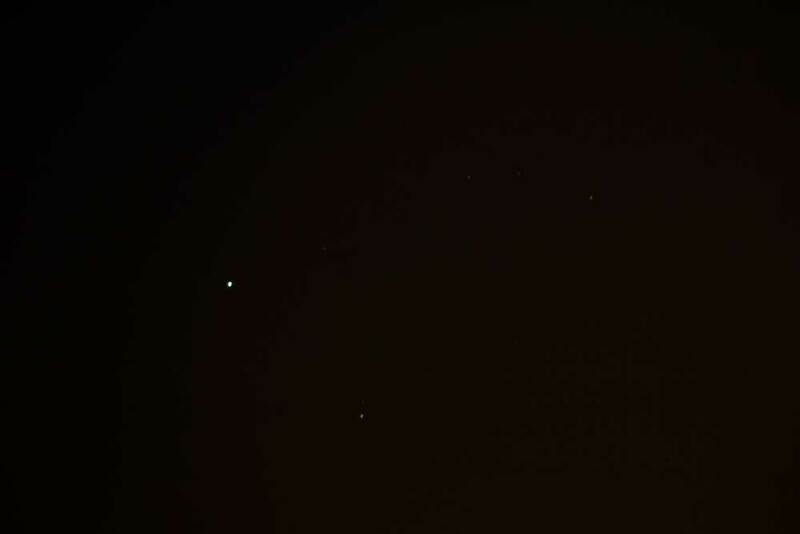 I noticed that the spotter scope did not focus too well on stars and shoed quite a bit of distortion, but, hey, the lens is light weight and I can get it set up very quickly! Now, for the big test, which was to finally capture an image of Uranus. This would finish off my goal of seeing and photographing all the planets. So, I commanded the goto to goto and, yes we arrived at the right pointing angles to see Uranus. See below. So, you might be thinking, how do we know that fuzzy blob is really the planet Uranus or not, because we have previously seen other blobs that turned out to be other things. So how do we know? Yes, you guessed it, we find other supporting evidence that confirms that the scope was indeed pointing in the right direction with enough accuracy that Uranus was in the field of view. So, we find the catalog location of Uranus is RA = 01 27 08 and Dec = +8 27 23. The center of the image frame is only about 10 arc minutes away from the predicted location of Uranus. This distance is much less than the size of the image, which is 30.6 arc minutes by 49.9 arc minutes. 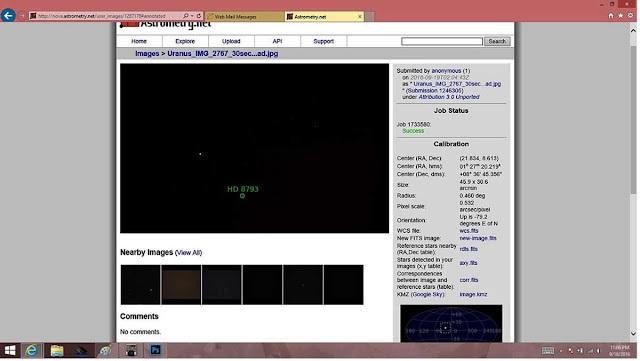 So, Uranus location is within the camera frame, but are we sure the white blob this time is really Uranus. Well, the image looks like a planet and not a star, even though we can be deceived, and the magnitude is comparable with the brightest object at that location. But to be sure there is one more step of astrometric analysis, where we use the actual positions of the background stars to identify the position of the white blob and compare it to the known position of Uranus. The AIP4WIN analysis screen shot is shown below. Remember that in a AIP4WIN analysis, several background stars, in this case 4 stars, are identified and brought to overlay right on top of the same four stars in the image. Sometimes the image must be stretched and scaled and rotated to get the overlay to lie right on top of the image, but once that is done, the actual position of any other object in the camera frame can be determined. So in the screenshot, the predicted location of Uranus, from the planet ephemeris, is shown as the middle of the three red circles. The target location, T1, is right on top of the white blob, and its location is shown in the right side panel as RA = 01 27 8.99 and Dec = +08 27 20.2, which is within a couple of arc seconds of the catalog position. Not to bad for this first measurement of Uranus. One interesting finding from this analysis was that no clear agreement regarding the focal length associated with the camera image. The instruction manual for the spotter scope, which I finally did take a look at, says the focal length is 1250mm. 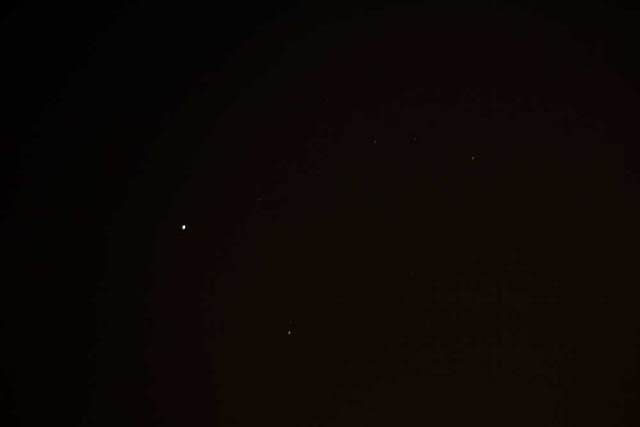 The astrometry.net analysis of the photo said the focal length based on the field of view was 1855mm. Then the AIP4WIN analysis required a focal length of 1667mm. Wow, what is going on here? Part of the discrepancy can be resolved. The spotter scope uses an image erecting prism in its optical path rather than the typical star diagonal mirror so that the images are upright and not mirror imaged, so that the image agrees with the same orientation that you would just see with your own eyeballs. Could this image erecting prism, which brings the image out of line by just 45 degrees, not 90 degrees like the star diagonal, also affect the focal length? Yes, an internet search confirmed that the image erecting prism does increase the effective focal length of the scope. What is still not resolve is why the two analysis software tools show different values for the focal length. I still do not know the answer for this. If you know, please let me know! Finally after all of this hard work, Resident Astronomer Peggy and I went off to run some errands and decided to try a new place down by John Wayne Airport for lunch, called Bosscats. It was quite nice and I could get my martini so all was well. 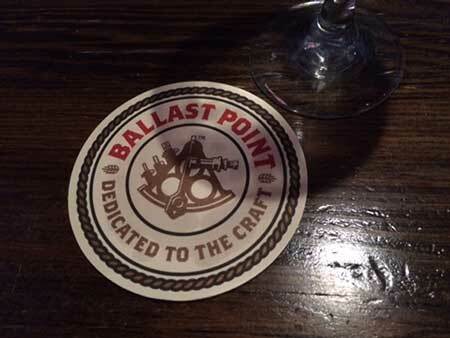 Then, I noticed the bar coaster on which my martini was sitting and I finally know now why I think about astronomy and martinis at the same time. There was a sextant in the bottom of my glass. Now that to me is finally conclusive evidence for the connection between my interest in astronomy and martinis and when I look into my martini glass I see all sorts of things and think all sorts of thoughts.